Ordinal classification problems are applied in many fields. In the field of multivariate statistical analysis, these tasks are referred to as ordinal regression problems. In the field of management decision-making, they are known as multi-criteria decision analyses or sorting problems. This paper introduces the PairCode algorithm for ordinal classification with small sample sizes, which is based on a pairwise comparison strategy. In addition, this work outlines how to use pairwise comparisons to transform ordinal classifications into disordered regressions and how to transform the results of disordered regressions back to their original ordinal categories. Some effective strategies have been put forward, such as designing a class-label encoding matrix for the pairwise comparison, balancing samples, training classifiers, and predicting new samples. In numerical experiments, our algorithm (PairCode) is compared with the ordinal logistic regressions (LogisticOP) (Hu et al., IEEE Transactions on Knowledge and Data Engineering, 24(11), 2052–2064, 2012; Harrell 2015b), SVMOP (Gutiérrez et al., IEEE Transactions on Knowledge and Data Engineering, 28(1), 127–146, 2016; Leathart et al. 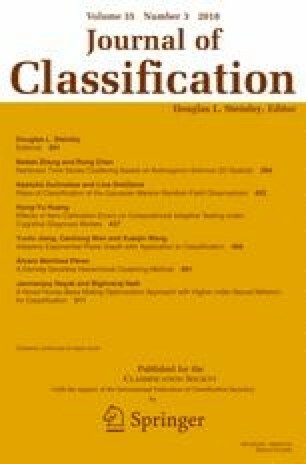 2016), SVORIM (Chu and Sathiya Keerthi, Neural Computation, 19(3), 792–815 2007; Gutiérrez et al., IEEE Transactions on Knowledge and Data Engineering, 28(1), 127–146, 2016), SVOREX (Chu and Sathiya Keerthi, Neural Computation, 19(3), 792–815 2007; Gutiérrez et al., IEEE Transactions on Knowledge and Data Engineering, 28(1), 127–146, 2016), and ELMOP (Deng et al., Neurocomputing, 74(1), 447–456, 2010; Gutiérrez et al., IEEE Transactions on Knowledge and Data Engineering, 28(1), 127–146, 2016). The results show that the PairCode algorithm performs better and is relatively stable as reflected by the correct classification rate (CCR), the mean absolute error (MAE), and the maximum MAE value (MMAE). However, the computing speed of the PairCode algorithm for classification is slightly slow and therefore warrants further study to improve the speed. We would like to thank the anonymous reviewers for their comments and suggestions which greatly improve the manuscript. The work is supported by the NSF of China (No. 11871447), and Anhui Initiative in Quantum Information Technologies (AHY150200).